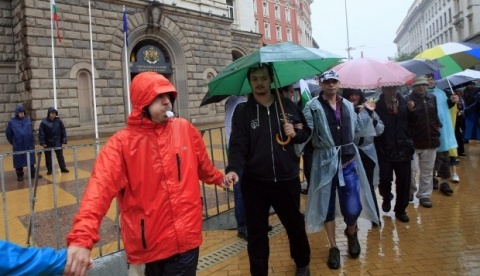 Despite the torrential rain, anti-government protesters are gathering in front of the Council of Ministers building in Sofia for the 17th day in a row. According to reports of dnevnik.bg, some 500 people have blocked traffic in front of the government headquarters in downtown Sofia. Unlike previous days, there are very few flags and posters due to the heavy rain, yet the booing and the "Resign! "chants continue. The protesters are expected to head for the traditional 7-km route including Parliament, Eagle's Bridge (Orlov Most), the National Palace of Culture (NDK, the headquarters of center-right party GERB, the Bulgarian Socialist Party (BSP), and the ethnic Turkish Movement for Rights and Freedoms (DPS) party, and Eagle's Bridge again as a final destination. The afternoon protest is the second one on Sunday, following road blocks of the Brussels Blvd in Sofia and the Trakia Highway near Plovdiv earlier the same day. Meanwhile, a counter-protest took place in front of the National Palace of Culture (NDK), with some 20 people insisting that the socialist-led government of Prime Minister Oresharski, which had come under attack on its second day in office, be provided normal conditions to function and implement its program. The series of anti-government protests in Bulgaria was triggered by the scandalous appointment of media mogul Delyan Peevski as Chair of the State Agency for National Security (DANS). Although the appointment was revoked, the people went on to demand that the cabinet resign collectively over ties with oligarchs. Protesters are also calling for Election Code amendments which will guarantee greater representation of the people in Parliament.